H: Male patient, 17-years-old, severe headache, low blood pressure in the legs. INFO/WWW: Coarctation of the aorta is an ongenital abnormality in which the aorta has constriction - resulting stenosis of the aorta. When the coarctation is distal to the ligamentum arteriosum, a good collateral circulation usually develops between the proximal and the distal parts of the aorta via the intercostal and internal thoracic arteries. 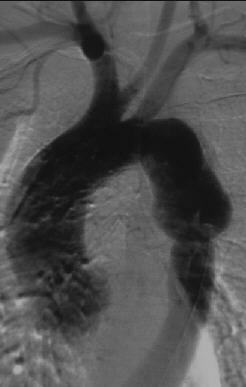 Coarctation causes increased blood pressure in the ascending aorta and arch.